Recently I have come across several Moroccan dishes that have sounded pretty interesting. They are interesting because they tend to include a lot of spices and flavour combinations that I would not normally think of using. The Moroccan dishes also used dried fruit and harissa for some sweetness and some heat. I have also come across several tagine dishes. A tagine is a clay pot with a lid that braises meat very efficiently. The tagine can be baked in the oven or it can be cooked on the stove if the tagine has a metal bottom. In the end I decided to go with a Moroccan lamb tagine . This dish could also be made with beef but I went with lamb since there is a lot of nice looking lamb in the stores now. Since I don’t have a tagine I braised the meat in a covered pot at low heat on the stove. The Moroccan inspired lamb tagine turned out really well. The flavour combinations were really amazing. The spices, the sweetness and the heat all balanced out well. I served the lamb tagine on lemon and mint couscous and garnished it with toasted almonds and cilantro and parsley. Overall it was a very tasty meal. Mix the paprika, turmeric, cumin, cayenne pepper, cinnamon, cloves, cardamom, salt, ginger, garlic, coriander, saffron, lemon zest and oil in a ziplock bag, add the lamb, mix well and marinate the fridge for a few hours to overnight. Heat the oil in a large pot over medium-high heat, add the lamb, brown well on all sides and set aside. Add the garlic and ginger and saute for about a minute. Add the lamb, tomato paste, beef stock, carrots, apricots, dates and figs bring to a boil, reduce the meat and simmer covered until the lamb is fall apart tender, about 2-3 hours. Add the honey and harissa. Option: For One-Pan: Make this a one-pan meal by adding 1 cup couscous and 1 1/2 cups broth after step 7, bringing to a boil and removing from heat to let sit, covered, until the couscous is tender, about 10 minutes. Slow Cooker: Optionally implement steps 1-4, place everything except the cilantro, parsley and almond in the slow cooker and cook on low for 6-10 hours or high for 2-4 hours. Bring the water to a boil and mix in the couscous. Turn off the heat, cover and let sit for 5 minutes. Mix the lemon juice and oil in a bowl. Mix the lemon and oil mixture and mint into the couscous. When we lived in Andorra our next-door (relatively speaking in the mountains) used to fix wonderful lamb tagines – very similar to this. I may have to start making my own… Thanks for the recipe! Another amazing dish! I really wish we were neighbors! I’ve seen alot of these dishes around but unfortunately haven’t had the time to make them. Your’s looks great! Despite the long ingredient list this is a straightt-forward dish. You’ve done the tagine proud, Kevin! A friend just bought a tagine and I was jealous already and now seeing your post makes me want one even more! Nice work! There are so many ingredients! I love Moroccan food! Our last supper club had that as the theme, and the food was simply amazing! I just love the flavors and spices. that recipe list is not fooling around! it sounds delish, and the picture is gorgeous. with all those spices, how could it not be fantastic? This dish sounds and looks pretty interesting. Another recipe to the long list of International food, Yay! 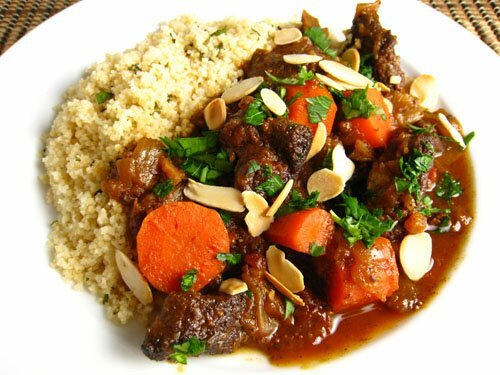 Lamb tagine is my favourite dish of Moroccan cuisine. This looks delish and kudos on the presentation! I really have a hard time making stews/casseroles presentable, but you pulled this off brilliantly. What a yummy recipe! Lamb dishes are pretty popular in my cuisine of Azerbaijan, and we have recipes somewhat similar to this. Kevin, you did a great job and the picture is just mouth-watering! This looks like nothing I had during my time in Casablanca…it looks 10x better! You’re a star! Again! Very impressive, Kevin. I love Moroccan food, especially tagines. You did a great job with it! Gosh, I am so hungry now! Tagines are delicious – I have never ventured into trying to make them at home, but they are one of the most comforting type of meals. Great choice on the lamb too – the tender meat must have been good with the couscous. Great job! Kevin – you’re killing me – not only do I love the finished product of a Moroccan tagine, I’d love to have the actual pot. Even the small individual tagines are an incredible presentation of a wonderful dish. Man, this looks wonderful! I’m a big fan of lamb, and this spice mix sounds perfect. Moroccan cooking suddenly seems to be popping up all over the blogosphere. I recently made a Moroccan braised beef dish that incorporates golden raisins and slow oven braising. Also quite good. Oh Kevin, this is really a keeper. Just reading it put the tastes of all those spices in my mind. I need to make some Moroccan food ASAP! Delicious! I actually went to Morocco, but I didn’t eat anything as good as this. I do remember the mint tea quite vividly though. That is quite the list of ingredients. I have put off making a tagine because I don’t have the pot. Hearing about your success has sured me of that. Hey Kevin, I’d really dig how to make that in a Tagine. I hear it’s much better using the traditional pot. In one recipe they put the carrots on the bottom and let them burn a little. Thank you so much for this awesome recipe! I made it for my Super Bowl party and my guests (who can be quite picky about food) lovvvved it. I tripled the recipe to accomadate more people and it was still no problem. Thanks! Your recipes look AMAZING and the photos are absolutely beautiful. I became an instant fan because your recipes are not monotonous, but very versatile and colorful instead. Thank you so much!!! I will definitely be visiting very often. I found your site tonight and whipped the tangine together. I subbed a couple ingredients: ground lamb, some green beans since I had one carrot. I also realized I didn't have nearly the amount of time needed so I pressure cooked it for 30 min and then added the fruit and vegies for another 30. It was wonderful! Even my kids ate it! WOW, thank you for posting this. This looks delicious. I was wondering how many people does it serve? Sarah Jones: This makes 4 servings. I made this with camel meat instead and it turned out great. Thank you.